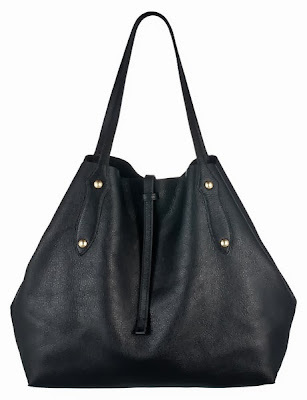 this season, a roomy, supple, and simple leather tote is really appealing to me as a work-to-weekend hold-all. one of my favorite (and most-used) bags of the year has been my trusty annabel ingall trio (see my review). the craftsmanship and leather quality is superb, and it still looks new in spite of the fact that it has accompanied me on countless grocery-shopping trips, subway rush-hour rides, and across more than a few countries this summer. recently, a number of friends and blog readers have asked for my recommendations for an elegant yet functional leather work bag. my top pick is the isabella tote. design: i love the supple calf leather, minimal hardware, clean lines, and complete absence of logos. thoughtful details include metal 'feet' at the base, and a large interior zip compartment and ID/metrocard slot. the overall aesthetic embodies quiet luxury, which in my opinion is ideal for most work environments. the larger size has room enough for all the weekday essentials: laptop, work files, a brown-bag lunch, an extra pair of flats or gym shoes. perfect for weekend shopping at the greenmarket, too. usability: typically, i would balk at a bag without a top zip closure, but the reality is i carry my longchamp open 99% of the time for convenience's sake. i quite like the idea of carrying this tote with the sides tucked in. because the shoulder straps have a medium drop (similar to the LV neverfull and goyard totes), the bag remains close to your body. et voilà – a streamlined and unfettered way to wear it while still keeping your things secure. a friend has the Celine cabas and uses it for work – it's beautiful and she wears it well. the AI tote is an equally luxurious option and the price, as they say, is right. available in more colors here – the burgundy one just made it to the top of my holiday wishlist! P.S. : check out this lower priced minimalist tote by Madewell too. what do you think? what's your work/wishlist bag? I love the way the corners fold in, it gives it such a nice line and makes it feel a little bit more special than your average tote. Not that I have anything against a straight tote - I have one that I got in the bazaar in Istanbul ages ago and it is one of my absolute favorite bags - but it's nice to see an option to get away from the straight rectangle. My favorite color would probably be the saddle, I imagine it would age so beautifully. agreed! another reason why i love this version over some of the other rigid leather totes this season that are a bit too boxy IMO. i was wondering if you managed to make it to everlane's #secretgarden popup location in NYC recently. apparently they showed off their new 'black' collection there. Beautiful bag! Still out of reach for me, price-wise, sadly. I'd love to find something reasonably similar in the $150 -$200 range. Maybe a Longchamps is the way to go (they're a bit sporty for me, though). Thanks! The MW one is lovely--the cognac straps are a nice detail. I love all the colors this bag comes in and I like how sturdy the straps seem! My dream work bag is the Mansur Gavriel large tote, but I worry that it won't be sturdy enough to hold my laptop, charger, and all the other things I need for the day. Since I'm so hard on my work bags, I ended up getting one of the Madewell Transport Totes. It is simple, unstructured, and roomy. Most importantly (for my purposes), it looks professional enough for academia and it was not terribly expensive, so I don't feel too bad about it getting beaten to death. Minimalist totes have always been my go-to work bag of choice simply for the fact that adding the weight of hardware to a laptop, notebook, lunch and other assort crap that I carry around just seems silly. I was tossing up whether or not to get a Celine Cabas in the oxblood but the thought of lugging it around on the train made me baulk a little. About 12 months ago I invested in a burgundy Mulberry Dorset tote in the large size and it has been perfect. The leather is thicker and, I think, more sturdy than the Cabas - plus at half the price I'm a little less precious about commuting with it... especially in the belting rain we've had recently. If anything the handles could be thicker but other than that it is perfect. I love that black tote! So elegant. I've been carrying a plain leather tote by Jas MB since July and I love it - perfect size for a stack of work, a book and my lunch. It's a stiff recycled leather which is perfect for me - nice and hardy, since I'm a bit of a klutz. 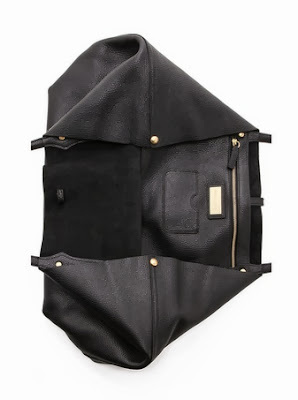 My similar obsession with a simple black tote started about 6 months ago, and after much searching, and considering options that were over $1k, I went with the Baggu Oversize tote in black, have been using it constantly and absolutely love it. It's $240. Many sites sold out of it, but I'm sure it will be back at some point. And Urban Outfitters has the same bag in a more narrow version (although I'd wait for the East-West size). The elusive work tote... It's so hard to find something elegant and professional that can hold chargers, laptop, files and all the other necessary items needed to get me through the work day without being too heavy. I find that so many gorgeous bags are just too heavy for everyday use and that's before they're loaded up. I attended the Mansur Gavriel preview last month and the bags are great for understated work bags. I do love the Celine Cabas, but it's too unstructured for my work needs and just doesn't look professional enough. It would be a weekend bag for me. The funny thing is every time I try it on at Celine I've noticed that it looks so disproportionately huge on me. Even the sales assistants always find that surprising.